I feel like I haven’t really gotten out much lately. Which would explain my lack of blog posts! I always struggle to feel inspired in January, the high of Christmas is over and us Londoners are left with the drab reality of drizzly streets and a vitamin D deficiency. This year I have even more reason to stay home and snuggle in, the house still needs a lot of tweaking (although the nursery is coming together nicely!) and as Bump grows I have to begrudgingly accept that I need to take things a little more slowly. Rather than racing home after yesterday’s doctor visit, my boys and I took the chance to explore Marylebone a little. Find a little colour to brighten up our rather monochrome January. And oh boy, did we find a splash of colour! Ordering up a storm and cosying up outside for a spot of people watching. 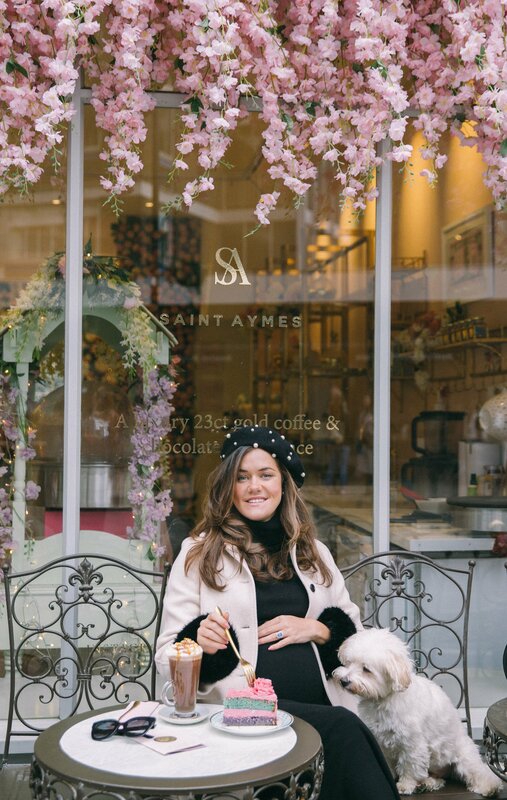 Saint Aymes is a funny little café hidden away on Connaught Street. Plastered with flowers inside and out, they serve up sweet nothings in all colours of the rainbow. …while the cakes are best shared. Certainly not set to take the London culinary world by storm, it is nevertheless the perfect spot for a cheery afternoon pick-me-up, and just the thing if the winter blues are getting you down. Wrap up warm, sit outside and take a friend to share with!